Lovely, elegant home in autumn leaf estates on 1. 28 acres, with generous ensuite master bedroom on main level, meticulously loved and maintained. Entertain in style with a gourmet kitchen showcasing high-end jennaire appliances, wall microwave and oven, flat-top induction cooktop, square edge quartz countertops, bosch dishwasher, direct vent hood, subway tiles, island, wine storage and custom cabinetry. Bright great room with surround sound, cathedral ceilings, columns and show-stopper fireplace. Formal dining room with tray ceilings, chair railing, wainscoting and chandelier with medallion. Glide thru the center hall grand foyer, past a study/office to the upper level, complete with 3 bedrooms, 2 family bathrooms and an open balcony/hallway overlooking the great room. Discover another amazing suite on the lower level, completed by a gourmet kitchen with tray ceilings and high-end amenities, island, low counter seating, custom cabinetry; a second stunning great room with tray ceilings, magnificent custom cabinetry; dining area, private bedroom and bathroom, and lavish sunroom with fireplace. From either level, venture outdoors to the patio and heated, saltwater pool with charming waterfall and self-cleaning abilities! Go a step further thru the open breezeway to another combo garage/office/studio with private bathroom and balcony. Laundry facilities are on the main and lower levels. There are 4 garages and brick and masonry foot paths surround the home. 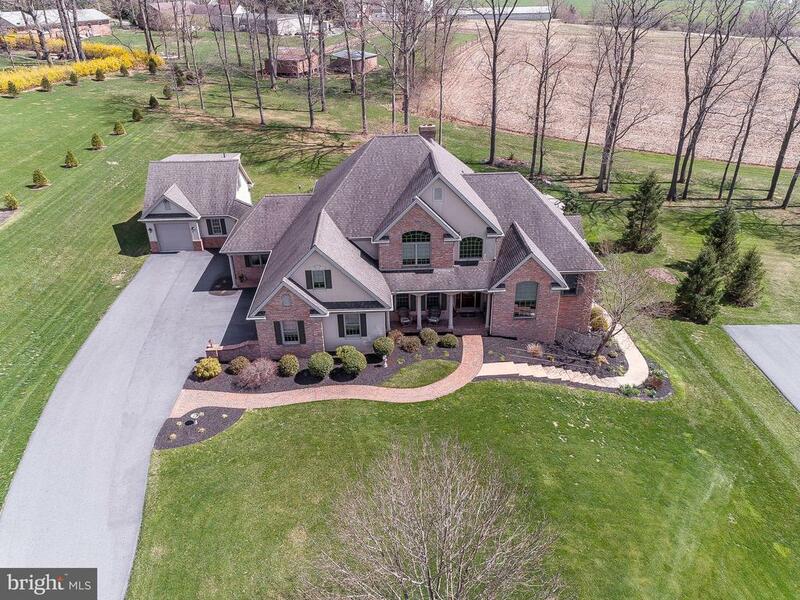 Offering many ways to live the life of dreams, this exquisite home with pastoral views and rural setting will evoke relaxation, tranquility and good times with family and friends. An easy commute to greater harrisburg, hershey, lancaster, reading and philadelphia.